Maren turned three on Wednesday, and since she loves all things pink, and the Pinkalicious books, we jumped on the bandwagon blazed by my good friends Lei at My Many Colored Days and Alicia at Growing Spuds, I threw her a Pinkalicious birthday party for her very first "friends" party. We were a little bit nervous that it might not be well attended two days before Christmas, but amazingly enough, everyone came! Aunt Jilly and Uncle Carl transformed the dining room into a little girl's pink paradise. There were LOTS of streamers, you just can't see them all in the picture.We played Freeze Dance, decorated cupcakes, read Pinkalicious and Purplicious, blew out candles, drank pink hot chocolate, and opened presents. I think the girls had a good time, and I know that Maren loved her birthday! She's already telling me what she wants to do when she turns four. I posted about the house, now here's the people in the house. All ten of them. My mom and dad, sister and brother-in-law spent Christmas week with us, and we partied hard! Isaac in his favorite outfit (he wore this Woodstock as reindeer shirt nonstop for most of the month of December) out shoveling the back yard. Fairies dancing in their Halloween costumes. Decorating the traditional gingerbread house with Aunt Jilly and Uncle Carl. Notice the Coke Zero in the foreground. I think we went through eight 12-packs of Coke Zero and Diet Dr. Pepper during the week. Making flourless chocolate cake while looking like the Unabomber. My mom would like the record to state that she worked on the gingerbread house too. Bryce and his auntie. Notice the mark on Bryce's upper lip. He decided to try out shaving, while holding the razor sideways. Youch! Freezing our buns off at Temple Square. All except for me, because my coat is big and puffy enough for the whole family to hide inside. And Eddie, because he had to work. And Jilly, who took the picture. We only lost one child while we were there. We always lose at least one. Isaac was awfully proud of himself for spending Monday skiing at Brighton. He had to be dragged (literally) into the morning lesson, but was navigating the bunny slope like a champ by the afternoon. Bryce and Eddie head over to the Majestic lift for his first foray off the bunny slope. Bryce really got the hang of skiing and was sailing down the hill pretty confidently by the end of the day! Annie may never forgive me for posting this picture of her, but this is about as happy as she got during the afternoon of our ski trip. She had a great lesson in the morning, but got nervous when it was time to test out her skills without an instructor. 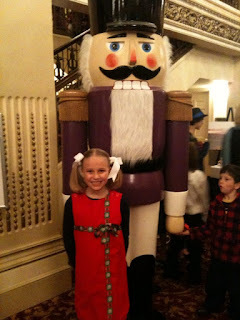 She perked up considerably by the time we took her to The Nutcracker that night at Ballet West. We don't have pictures of Tuesday, when Eddie saw BYU win in both basketball and football in Las Vegas, and I almost killed my parents sliding in the ice in our minivan. Once we traded cars, we had the quickest dinner ever at Red Iguana (no wait, appetizers and dinner in about 30 minutes-- the key to eating there must be to go during a snowstorm) and a great time seeing Savior of the World at the Conference Center, reloading our phones for updates on the football game when we could. Wednesday was Maren's birthday, which will get its own post. We brought cookies and hot fudge to the Christmas Eve dinner at Eddie's parents' house. Prepping and eating with the girls in the kitchen. Chaos reigns on Christmas morning. The whole gang for Christmas dinner. Like how my mom snapped a picture of her food? Apparently I got no pictures of my living room or entryway, or the adorable candy cane chandelier, or the cute little kids' tree in the basement. If I can steal Bryce's camera away from him again sometime today, I'll update it again. A head-on view of the bed. We recovered the headboard yet again (it's been yellow corduroy and white linen in previous incarnations). We also boosted the headboard about a foot and bolted it to the wall. The bedside tables are brand new, from the Thomasville Bogart collection, bought for about 1/10th of the original price from someone's garage in Sandy. Not sure it's legal, but it works for me. The white sheets, duvet cover and bed frame came from Overstock. The matelasse bedspread is from Lands' End. 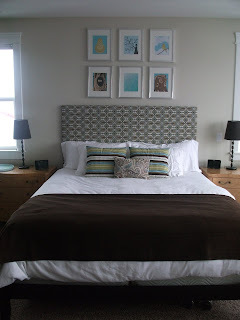 The three fabrics on the bed are by Premier Prints, which I bought from Warehouse Fabics. 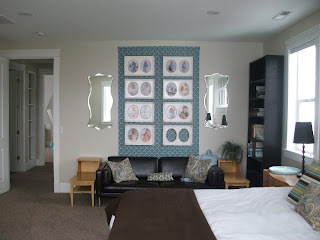 The headboard fabric is Elizabeth, the larger striped pillows (and the bookcase, visible later) are Veranda and the smaller pillow is Paisley, all in chocolate/natural. The lamps on the nightstands are old, from IKEA, but I replaced the shades with some chocolate brown ones I found on the clearance table there. The turquoise tray on the left nightstand is from Hip and Humble here in Salt Lake City. The prints above the bed are from studiolyon's Etsy store. 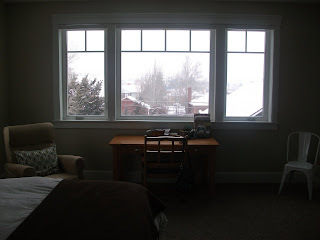 This is one of my favorite views of the bedroom. We had pictures taken of each of our kids at six, twelve, eighteen and twenty-four months, and once I got all of them, I had no idea how to display that many pictures. But this house has tall ceilings, and therefore big walls, and even though I've spent years regretting getting the pictures printed SO BIG, I think they work here. 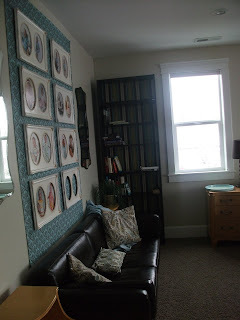 Instead of painting an accent wall, we got a two-yard piece of fabric (also from Warehouse Fabrics-- Madison Kelso/French Blue) that I hemmed and nailed up behind the pictures, and gives a lot more contrast between the white frames and beige walls. The couch and mirrors are from IKEA (couch by way of KSL classifieds) and I scored the end tables for $35 for the pair from the classifieds too (I spotted them in the back of an ad for something else and emailed the seller to see if he'd part with them). Eddie got me the cashmere throw from Christmas from Lands' End. This is kind of a weird shot, but I wanted to show off that there's another bookcase (also an IKEA Billy in black-brown) just like the ones we have in our family room downstairs. This one is backed in the same striped fabric as the pillows on the bed. And speaking of pillows, I made the cases for all of the pillows in about an hour and a half. Envelope covers are so easy. I just kept finding old discarded throw pillows around the house and covered them until the fabric was all gone. The rest of the room is still a work in progress. The chair was from Maren's nursery, and will eventually be relocated. Eddie wants a big brown leather recliner, which he will be permitted to have, provided it's not too ugly. We're replacing our single desk with two build-your-own IKEA desks, which will sit side-by-side under the window. The unfinished wood will be painted either olive green or french blue with storage underneath and have either frosted glass or stainless steel tops. The white Tolix cafe chair on the right (the same chairs we have in the dining room) will go with both desks, assuming we can find another one. The last picture is of the dressers. 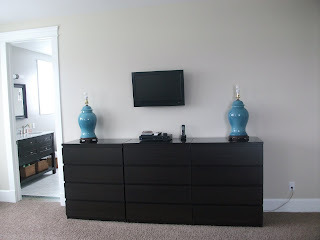 They're the Malm four-drawer dressers from IKEA, topped with dark glass. The lamps are big! They're 1950s Eames lamps that I bought for $23 apiece from eBay. I have drum shades ordered for them, but they haven't arrived yet. Eddie also has big plans to upgrade the television.